Looking for a way to kick start your inbound marketing in 2019? Searching for methods to generate more leads? Hoping your readers will engage and interact with your website more? Call-To-Actions (CTA)s are the perfect solution! A call-to-action (CTA) is an image or line of text that prompts your visitors, leads, and customers to take action. It is, quite literally, a "call" to take an "action." An example of a CTA is “click here”. These are the buttons that say, “Sign up for free,” “Claim your free trial,” or “Go premium.” Amazon, Netflix, and just about every other website that you visit includes these buttons. Which should hit home the point that your website a) needs to include a CTA and b) that CTAs can be incredibly effective at gaining leads and boosting your inbound marketing. 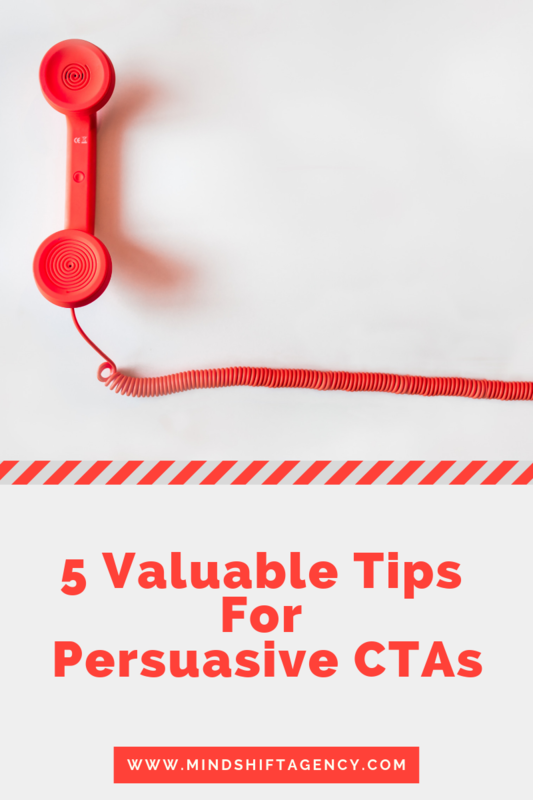 To help you out, here are our 5 useful tips to create effective, convincing and persuasive CTAs! You’ll notice a theme of “repeat.” That’s because having more than one CTA or having various CTAs in multiple places is the best method to general leads, jump start your inbound marketing, or encourage your audience to interact with your website. Tip #1: Repeat in the top navigation. As I already mentioned, every website benefits from having a CTA. The best place to strategically plop your CTA button? In the top navigation. This design element follows a visitor everywhere they go on your website. It’s repeated on every single page of your website. So it’s the ideal place for a conversion point! Perfect, minus the one catch...The top nav has a space constraint. Don’t allow that to freak you out. Condense your CTA to be small yet descriptive, providing enough context to be a conversion point. That may sound impossible, but it’s doable! Instead of writing, “Have a question?” or “Want to talk to sales?” or “Get a consultation,” your CTA could read “Talk to us!” That’s a conversational phrase that addresses all three of the initial questions in one common button. Bonus tip: Make your top navigation CTA button visually stand out from the rest of your design by using contrasting a color scheme. This attracts the eye of your visitors and boosts the likelihood of clicks. Tip #2: Repeat in the top banner. In addition to a top navigation CTA, a top banner CTA is a great use of space and an effective method to drive clicks. Be sure to use a rockin’ image, engaging video, or attractive text to clearly describe the conversion offer for your reader. I personally love how well top banner CTAs blend those three elements together for a persuasive (and eye-catching) conversion. At a glance your top banner CTA should answer your audience’s question, “what’s in it for me?” Make the verbage personal, aligning your offer with your customers needs or desires. Try to select an image that relates to your ideal customer; featuring real people using your product is a great option. Lastly, provide a short video to nudge that curious website visitor to take the step to become a loyal customer. Tip #3: Repeat at the bottom of the page. Adding a click-worthy CTA at the bottom of a page is similar to including a conclusion at the end of an essay or article. The top banner CTA offers a reason to convert, while the bottom CTA drives it home. And, following our theme of repeat, this is a great example of giving your reader what they desire: options! That may feel at odds - to have two CTAs on one page that are both attempting to be conversion points. Don’t worry, both of those are the next right step toward conversion depending on the lead; one is ready to purchase and one needs a bit more time to consider their options. After all, CTAs are about meeting your visitor where they’re at (metaphorically of course, since this is the world wide web!). Tip #4: Repeat on the bottom of a blog. Oftentimes blogs are the most trafficked places on a website. Readers are attracted to the helpful, free information that either feeds their curiosities or resolves an issue in their life. However, many visitors immediately skedaddle once they’ve read the article they’ve come for. Fight this trend and help them resist the urge to search elsewhere by giving them something worth staying for. Showcase other great content on your site, reference another article on a similar topic that the reader could find helpful, spark thoughts with a provoking question related to the article, or just link to the “next article” in the lineup. How can you do that? With a simple CTA at the bottom of each blog. It only takes one button to seal the deal. Tip #5: Repeat for each pain point. Plain a simple, a pain point is that sticky area where your buyer always gets stuck. Perhaps it’s with the tricky measurements needed, or the enormous shipping charges, or the personalization. Discover what makes a lead hesitant to purchase your product and investigate what would smooth over that process. Then - BAM - build in a CTA in the exact location of the pain point. If the problem is tricky measurements, include a CTA with exact details on how to measure. For enormous shipping charges, add a CTA to explain the reasons behind the costs and a shipping cost estimator. And for the personalization, put a CTA for extra details, example photos, or inspiring ideas. A sneaky CTA will address your visitor’s concerns before they even realize that was a concern. If strategically placed, your website could include dozens of these. Feel like overkill? Remember that CTAs aren’t always focused on conversion, sometimes the most persuasive ones actually solve one of your readers largest problems. Take heart, there is no right or wrong way to start using CTAs. Just keep in mind that CTAs should provide helpful information to your reader while also helping them convert to a customer. Experiment with CTA placement, design, copy, images and videos. Try one in the navigation bar, homepage, blogs and more. Test one option for a month and then alternate to another; compare the data and success rates. One thing I feel certain of: your website and amount of customers will improve with CTAs! Stuck on where to begin with CTAs? Uncertain of your readers pain points? We’d love to consult with you to discover solutions to your visitors pain points, and morph those into clickable call-to-action buttons! Contact us today so we can help boost your inbound marketing, lead generation, and website engagement!